Nails have been slowly creeping up the fashion ladder with more and more focus being put upon them within fashion shows. Nail artists take inspiration directly from the clothes and put fashion trends onto finger nails. Last season we saw the likes of Jil Sander and Christopher Kane embrace all things fluorescent. From this came a foray of zesty and eye wateringly bright nail varnishes which became favourites for summer. My must-haves are Illamasqua’s Nail Varnishes Rare and Collide. Two vibrant shades of sun-bright yellow and ultimate shocking pink which are enough to give any eighties neon lover a run for their money! The current colour blocking trend transcends perfectly onto nails with the Half Moon design. The entire nail is painted one solid colour, a half moon shape is then painted from the cuticle upwards in a separate colour. To use this design to ultimate effect, I would use two bright clashing colours such as Illamasqua’s Nail Varnishes Gamma and Obsess. Illamasqua have used duo Nail Varnishes Boosh and Harsh to create their half moon nails. 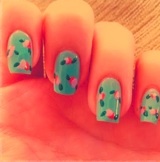 Fashion gives fantastic inspiration for nail art. Sequined covered dresses can influence glitter nail designs whilst a jewelled neckline could lead to tiny gems as decoration. However, some people prefer to take a more literal approach when it comes to using fashion for inspiration. Vintage floral patterns were huge for spring and there is no need for this trend to be confined only to your clothes. This being said, I decided to try my hand at creating floral nails. I painted the base of my nails in a mint green and then used a toothpick to dab on drops of nail varnish in two different colours for the flowers. I then chose a dark green colour using the toothpick to create small flicks either side of the flowers, this create the leaves. To re-create this use Illamasqua’s Nail Varnishes in Smash, Jan, Grab and Rampage. Alongside Summer’s floral trend were the spectacular fruit print creations. Stella McCartney created oranges and lemons whilst Muiccia Prada bought bananas back into fashion. Yellow has had it’s own come back on nails this season. Lo and behold, walking through East London’s Shoreditch last week what did I notice on a female passer by? The most fabulous eye-catching banana yellow nail varnish with actual bananas painted on! To recreate this look use Illamasqua’s Nail Varnishes in Wayward for the block yellow and Boosh for the banana detail. 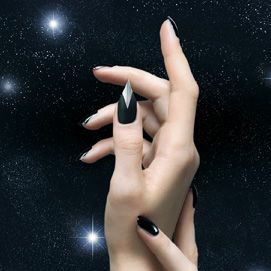 Illamasqua are a step ahead of the nail trend, stretching the boundaries of nail fashion even further. Genius manicurist Mike Pocock has created the handmade Nail Quill and Toxic Claw for Illamasqua customers. These nail extensions are designed only for the thumbs yet completely transform the hands into creature-like wonders. These false nails are utterly unique and are perfect for revealing glimpses of your alter ego. Illamasqua firmly believes in self expression and your nails are a way of expressing how you truly feel. You can use colour to reflect your mood and texture for dramatic effect. Use your nails as a creative outlet and express yourself! Thank you to Arianne Constantinou for this wonderful blog post!